Helen Anne Martens was born on May 20, 1923 to Abram and Anna Martens in Einlage, Russia (now Ukraine). She immigrated to Canada at age four with her parents, younger sister Judith, her grandmother, four aunts and an uncle. They landed in Montreal and endured a long train trip to Hanley, Saskatchewan where her grandmother’s brother farmed. Abram also bought a small farm. Helen started Grade 1 in Sheldon School. In 1933 the family moved to Rabbit Lake; then later to Glenbush, Sask. She took Grades 9, 10, & 11 by correspondence and Grade 12 in Rabbit Lake. Her love of learning led her to Normal School in Saskatoon. When she graduated, her first teaching position was in Old St. Walburg; then on to Medstead School Division. She taught Grades 1-10 in a one room country school house with an enrolment from 12-54 students, some of these students were her brothers. Helen married Sam Bergen on July 27, 1947 at Glenbush, Saskatchewan. Their honeymoon was the trip to Langley Prairie, BC where Sam dairy farmed with his parents and worked in the lumber industry for a short time. In 1949 they relocated to Luseland, Sask. to farm for 10 years. Helen taught school for a year to purchase their first tractor. Here the family grew to five children. They moved to Lacombe, Alberta in 1960 and settled in the Fairview District, where they farmed for eighteen years. Their youngest son, Wilfred, was born in Lacombe in 1965. In 1979, Sam, Helen and Wilf moved to BC where they enjoyed their home near Naramata, overlooking Okanagan Lake, for ten years before returning to Lacombe. Wherever life took them, Helen always enjoyed gardening and made friends easily. Sam and Helen enjoyed RVing for many years taking them to many places in Canada, USA and Mexico. Helen always enjoyed the scenery including the plants, birds and animals along the way. Helen is survived by six children, Les (Judy), Vic (Sue), Karen (David), Sylvia (Peter), Doris, and Wilfred (Gloria); ten grandchildren: Sean, Christy (Andrew) and their three children Nate, Leni and Reid, Nicole (Jesse), Karly (John), Marla, Eric (Paula), Katrina, Elayna (Josh), Marie (Brandon) and Arlo; five brothers, Abe (Margaret), Cornie (Marlene), John (Evelyn †), Walter (Rosella), Peter (Terry); two sisters, Anita (Art †); Hertha (Ervin †); two sisters-in-law, Hilda Bergen and Anne Cornies. Helen will also be fondly remembered by members of the extended Bergen and Martens families, and many friends and neighbours. She is predeceased by her husband of 70 years, Samuel; her parents, Abram and Anna Martens; sister, Judith; brother, Henry; her seven-year-old daughter, Judy; son-in-law, Laymon Whyte; and numerous in-laws. The family wishes to thank the staff at Royal Oak for the compassionate care given to Helen while she lived there. 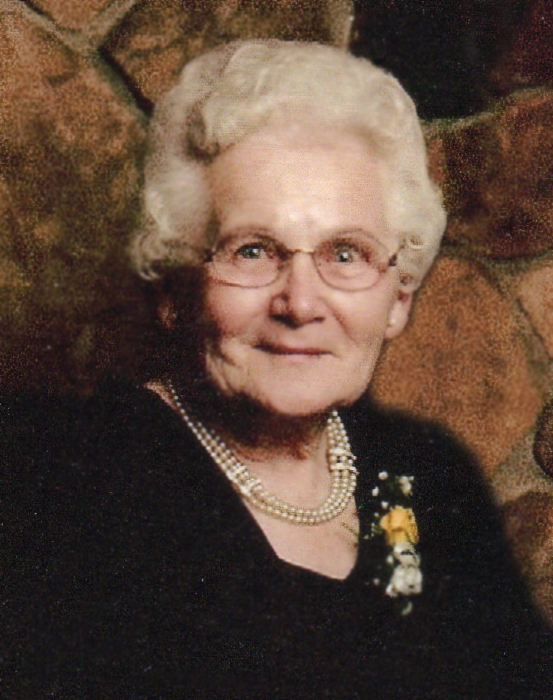 A Celebration of Helen`s Life will be held at St. Andrew`s United Church, 5226 – 51 Avenue, Lacombe on Friday, February 1, 2019 at 11:00 a.m. In lieu of flowers donations can be made to the Canadian Foodgrains Bank, Box 767, Winnipeg, MB, R3C 2L4, Mennonite Central Committee at https://donate.mcccanada.ca or the charity of choice.